Social Butterfly or Lone Wolf? Let face it, even the most outgoing person on the planet doesn’t like every person they meet! Some of us have huge circles of friends, while others of us stick to a select few. Dogs are no different. 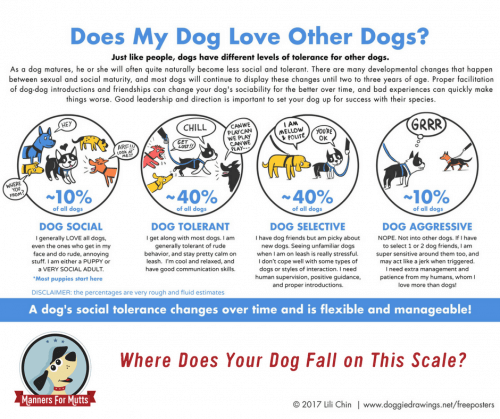 Even well socialized dogs don’t like every other dog they meet. Most puppies start out very social, but that changes as they get older. Like us, dogs get more particular about who they hang out with as they get older. It’s unrealistic to expect that our dogs will love every other dog they meet on the street. So, instead of getting mad at them when they snub another dog, we should be honoring their choices and not forcing them into uncomfortable social situations.